Sure, the hoverboard chase in Back to the Future 2’s 2015 sequence looks incredibly cool—but it was also incredibly unsafe. Just ask stunt performer Cheryl Wheeler, who was badly injured during filming. Find out more, in an exclusive excerpt from We Don’t Need Roads: The Making of the Back to the Future Trilogy. We Don’t Need Roads, by author Caseen Gaines, devotes an entire chapter to the hoverboards in the second movie. We find out how the movie producers were already fielding calls from parents demanding to know where they could buy a hoverboard, before filming was even completed—because a half-hour TV special about the making of the film aired during production, and it featured the hoverboards extensively. 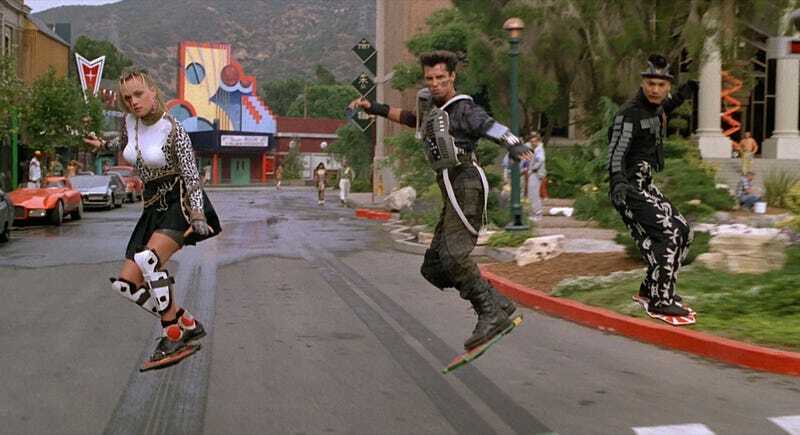 There’s also a lot about how the hoverboards were created using wires and greenscreens. And instead of using rotoscoping to paint out the wires frame by frame, as would have been done previously, Industrial Light and Magic used the then-new technology of computer animation to remove the wires. But there’s also a large section about a crucial stunt—where four gang members, chasing Marty McFly, crash into the clock tower. All four members of the stunt team were to be attached to a large crane, which would move back and forth, generating enough momentum for them to swing towards the tower. They would crash through the window, and then a member of the effects team would press a button, cutting their wires and dropping them onto airbags inside the tower. Easy, right? But during a test of the sequence, using sandbags in place of the stunt performers, one of the four bags fell on the ground instead of safely onto the airbags. Another time, two out of four sandbags landed on the ground instead of on the airbags. When the stunt was tested with live performers, two of them fell the wrong way and landed on an empty airbag, nearly breaking their necks. Stunt performer Lisa McCullough wasn’t willing to take the crew’s assurances that it would be all right on the day, and bowed out. So another stunt performer, Cheryl Wheeler stepped in. And then there was one more change on top of that: The crew decided to install a rocket under one of the stunt performers’ hoverboards, so it would look like sparks were coming out of Griff’s “Pit Bull” board. [Stunt coordinator] Walter Scott approached [Cheryl Wheeler] quickly, obviously ready to get on with the show. “Walter, I am not getting cold feet at all. I just want to understand. I was in hair and makeup and haven’t been out there to see the stunt setup.” She wanted to say a lot more. She wanted to put her foot down and insist on seeing the marks. She wanted to say she trusted them, because she really did, but she trusted her eyes and gut more. But she didn’t do any of those things. Maybe she bit her tongue because she was relatively new to the business. She had just started doing stunt work in 1985 and didn’t want to ruffle any feathers, while Walter Scott had two decades of experience under his belt. Who was she to ask him to prove anything to her? Maybe she was afraid, also, of appearing weak in front of the other stunt performers, or, more accurately, stuntmen. Lisa McCullough had already left with “cold feet,” and now Wheeler was exhibiting similar symptoms. She was as tough as these guys, wasn’t she? Why weren’t they asking questions? She got in her harness, which Croughwell had already stepped out of. But her mind still wasn’t at ease. She called over Greg Tippie, the special effects team member responsible for pressing the wire-cutting button. She asked him if everything was good to go and exactly the same as last time. “Yeah,” he said. “Listen, you do your job and I’ll do mine.” They were minutes away from starting. She was already dangling. “Your job and my job are really intertwined here,” she said. “I have a right to ask these questions.” As it turned out, things weren’t exactly the same, not even with how he was planning on doing his job. During the test run, Tippie hid behind one of the pillars of the clock tower and stared up, counting the stunt crew as they made their way through the face of the building—one, two, three, four. Once he could see they were all in, he pressed the button and down they came. But today he decided to move inside the tower. He thought it would be easier to tell if everyone had made it through if he was on the same side. But candy glass isn’t transparent. It has a dark tint to it and, because it’s made of sugar, actually sparkles in the light. You can see through it, sure, but only shapes and figures. With clear glass, Tippie would be able to see the stunt performers making their way toward the window. But now that would be more difficult, and after the stunt performers made it through the clock tower, the glass would rain down and it would be difficult to tell in a split second if everyone had made it through. He started to walk away, but she called after him. She was spinning like a figure skater, parallel to the ground like Superman in midflight. She hit the pillar dead‑on, but because she was covered in shin guards, knee guards, elbow pads, and other well-concealed braces hidden within her costume, she felt fine. A little disoriented, perhaps, but fine. As she was rotating, she noticed she was alone. The rest of her colleagues must have made it. This was supposed to be a one-take shot, but whatever went wrong meant they would have to do it again. Maybe they’d be pissed, but she was okay and, most important, Greg Tippie hadn’t cut the cable. He must have seen she hadn’t made it inside. Which might have happened if he had stayed outside the pillar. Or if the special effects team hadn’t gone with opaque trick glass. Or if there wasn’t so much smoke from the rocket. Or if she had gone with her gut and gotten answers to her questions. But that wasn’t what happened. 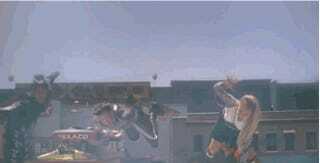 He pressed the button and the stunt performers were released. As two other stuntmen headed toward the blue pads, Wheeler fell flat, like she was lying in bed, from thirty feet in the air. She knew she was going to die. She was certain of it, as certain as she had been that she would hit that pillar. She was falling from too high an altitude. She was going to die on the Universal Studios backlot. We Don’t Need Roads: The Making of the Back to the Future Trilogy is out today. Read more about it here.